Did you try that one or hic’s? Lot’s of a single profiles have similarities between different mixers and just one difference of flavor choice or recipe choice is all it takes sometimes to find your white whale.Or at the very least find a good starting point on your own recipe to customize. I think in order to achieve this profile we need to layer the different blue razz concentrates together. 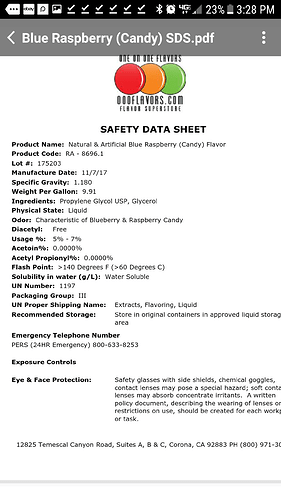 RF SC blue razz adds some high notes and "twang"
Use Eryrhritol and stevia to sweeten. Awesome amount of information there! I think you might be onto something there with 22%. 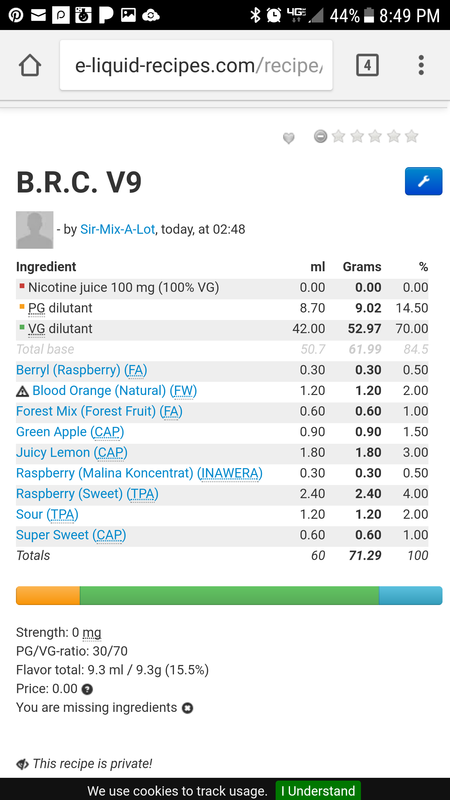 I’ve often asked myself if I needed to break the 20% rule due to some of the concentrates being weak (or at least the weight/SG being off) Looks like I need to pic up some Nic Vape blue razz… that sounds like something I might be missing. Just an add for more references! Sucralose sweetens differently than Erythritol or stevia it tends to sit on “top” of a mix where as Erythritol and stevia sweeten the mix from "within"
I’ve heard that sucralose is one of the few mediums that can effectively deliver/carry malic acid to your palate. Does anyone currently have both blue raspberry concentrates from OSDIY & OOO? Can anyone make an unscientific confirmation that they are the same (smell, taste, consistency, SG)? Could it just be coincidence that both OSDIY and LB’s blue raspberry are both 76% VG? Too coincidental? I am sure I read somewhere that the popular Blue raspberry slush drink is basically black raspberry flavouring? RF Have a very good Black Raspberry. If it is its got a lot of other stuff cause mine tastes nothing like it. I think this is going to be my next stab at it. What do you guys think at first glance? Lemme see here… Just got blue raspberry from DIYFS and it smells great. Still sticking with NicVape as my favorite until I test it after steeping. Raspberry, FA- I need to play with this more, but I believe there may be better raspberries for adding tartness (such as TFA sweet raspberry). Forest mix, FA- Which bring me to the forest fruit. I very often get blue raspberry from this, so good choice on putting it in there. Perhaps looking into which berries it is made up of while help further the complete blue raspberry profile we are after. 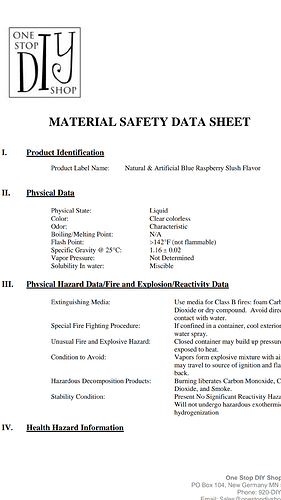 Raspberry (Sweet), TFA- This is a nice, tart raspberry, perfect for the profile. Some don’t like it but after trying many, I still come back to this as a favorite. 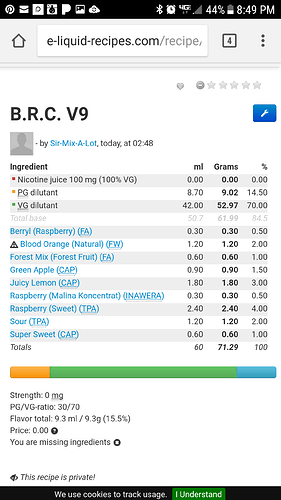 Sour- I have played with acids quite a bit and it seems they don’t have the intended effect. I could be very wrong on this, however, so take this part lightly. I heard that for acids to reach your palate, you need a sweetener to use as a carrier. Super Sweet- This is your sweetener. Have you found that it helps carry the malic acid into something you perceive? 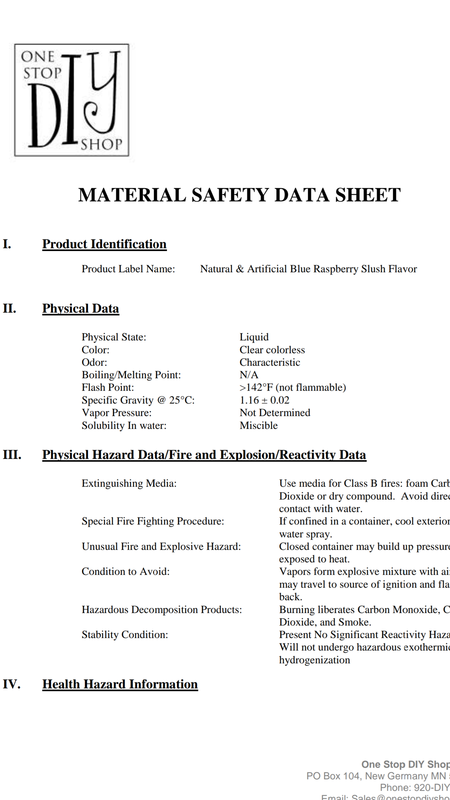 I have strayed from using this one, however as it contains Sodium Benzoate, unsure on how safe that stuff is… Still want to look deeper as I DO want to use it, I hear it is brighter than TFA sweetener (plus it has no maltol). When I think of blue raspberry, I think of those Blue Razz blow pops by Charms. This is totally it for me as well! This is a flavor i love and planed to work with, but a noob is no help to you - sorry. I plan on following this thread in hopes it will go somewhere and we find a charms blow pop!! Wow thank you so much for the breakdown and your thoughts. I’m waiting on some WF blue raspberry to get here that I’m excited to try. I don’t usually use sweeteners, but I too have heard that sweetener helps deliver malic/citrus to the palate, thus their inclusion. Not too mention the only thing the junk food industry loves more than malic/citric tart acids is sugar. I’m just going to piggyback on decades or their flavorists findings and probably millions of dollars of research and trust my gut that the two go together in this example. I lean towards super sweet just because it tastes the cleanest to me. I included for forest fruit for pretty much the same reasons as the green apple. I think you may be right about too much acidity in the profile overall. I know often times less is more, but I want this flavor ELECTRIC. I can always dial back and sub/swap/drop as needed. To be honest my choices in raspberry were just as much about capturing an artificial candy note as much as raspberry itself. However, I’m not against dropping the raspberry down a bit and using some jelly candy or something similar to capture that same essence. As far as I can tell, they’re not being sold by any other vendor. Although, I’d love for them to be picked up by some of the big guys like BCF, ECX, or Gremlin.